We launched Verity Mom with Seattle's Verity Credit Union in August 2009. At the time I had stated I was pretty excited about the launch for the following reasons. At the center of the program is a public search for a part-time mommy blogger. We think this is a really compelling story and the chosen mommy blogger has the potential of creating fantastic content. Fast forward two years and I am thrilled to say that all of these reasons I listed have lived up to and surpassed my expectations. Through the 2009 search, Verity surfaced 34 amazing Moms who all felt really passionate about the opportunity. In the end, Rosemary Garner, a documentary television producer, won the job. Rosemary's written and video work have been so exceptional that Verity extended her one-year contract for an additional year. Rosemary has built a loyal following that are always quick to leave an encouraging comment on her posts—1,584 comments to be exact! Through this program, smart product design and additional marketing activities, Verity Credit Union has done a fantastic job at positioning itself as a family-centered financial institution. 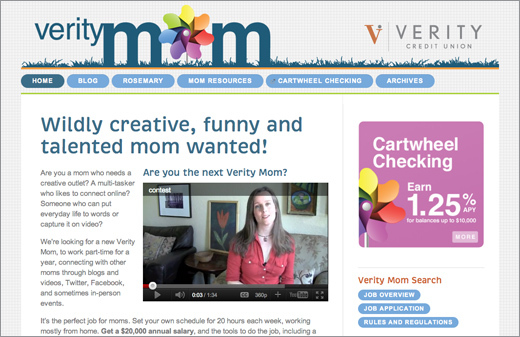 Today, we excited to announce the launch of the search for the next Verity Mom. To mark the occasion, we gave the site design a refresh. It will be interesting (and nerve-racking) to see if we can find a worthy successor to Rosemary! Also, a special thanks to Shari and Melina. They are a treat to work with and are always open to new and exciting ideas.